Are your clients at risk of owing AMT? Millions are. Approximately four million taxpayers are expected to owe alternative minimum tax (AMT), despite congressional action to adjust the exemption level. Introduced in 1969, the AMT is intended to ensure that wealthy taxpayers could not avoid income tax by exploiting weaknesses in the tax code. Since the AMT was not indexed for inflation, the number of taxpayers subject to the tax increased dramatically. In 1970, for example, the AMT affected only 20,000 taxpayers. 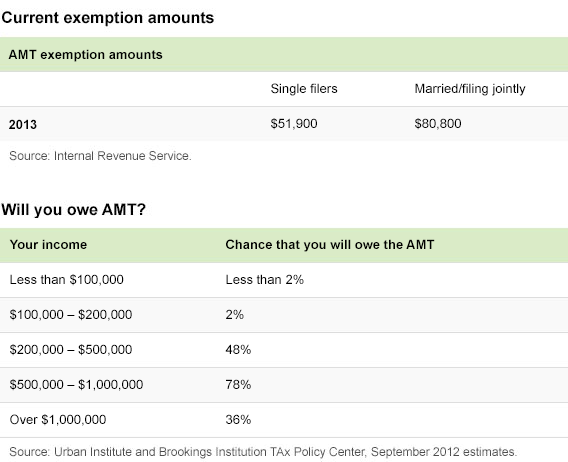 Today, the Urban Institute and Brookings Institution Tax Policy Center estimated about four million taxpayers will owe AMT. The bill could have been even higher. Without passage of the “fix” as part of the American Taxpayer Relief Act passed in January 2013, an additional 30 million taxpayers would have been subject to AMT. Clients who live in states with high property or income taxes. These itemized deductions are disregarded when calculating AMT. Clients claiming miscellaneous 2% deductions, such as unreimbursed employee expenses. These deductions are not included when calculating AMT. Clients reporting a large capital gain. The extra income from capital gains may increase income to a level where the AMT exemption amount would be phased out. For 2013, the income phase-outs begin at $112,500 for individual taxpayers and $150,000 for couples. Clients claiming many dependents. Personal exemptions are not allowed when calculating AMT. Corporate executives exercising incentive stock options. While exercising the stock option is not considered income, the “spread” between the market price and the exercise price is considered income for AMT. Investors who own private activity bonds. The income from this type of municipal bond is not subject to income tax, but is subject to taxation under AMT.